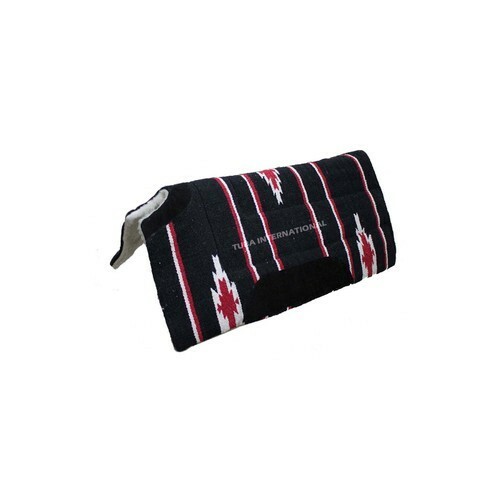 Description : Tuba International Western Saddle Pad made with high quality of materials in perfect design, premium quality, supreme finish. Delivery Time Depends on the quantity and shipping method. Packaging Details Export Standard Packaging. Established in the year 2008, Tuba International is positioned at Kanpur (Uttar Pradesh). Under the headship of our skilled mentors, we have acquired a huge clientele base across the world. We have well-developed infrastructural unit which is installed with sophisticated machines and technology enabling us to offer a qualitative range of products in bulk quantities. Besides this, our spacious warehousing facility enable us to keep our entire range in safe manner. The products that we offer are methodically examine on different quality parameters in order to avoid any kind of defects. Our range is packaged using high-grade packaging material ensuring no tear and wear while delivering. Backed by a support of skilled craftsmen, we are able to offer products in unique designs with other specifications. Moreover, our advanced transit facilities help us to deliver our products within the committed time frame. Currently we have 2 exporting companies in India. Since 2008 we are on the market of Horse and Dogs products. We have well qualified and experienced staff. Our products are always checked under strict quality control system to provide the best part to our clients. We never compromise with the product quality. Price are always lower than of any other manufacturer.